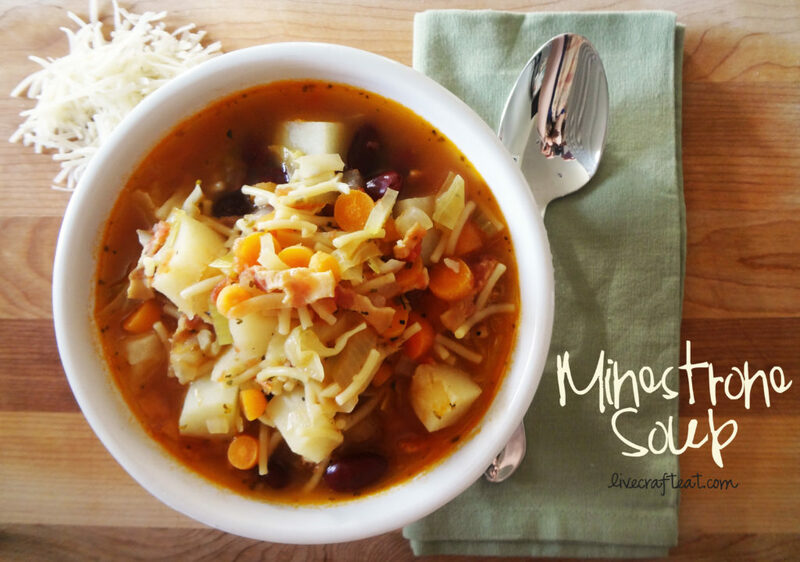 why is this my favorite minestrone soup recipe? there are several reasons. here are a few. 1. it has bacon in it. need i say more? 2. i happen to be a vegetable lover and so having a vegetable-loaded meal always makes me happy. 3. my mom used to make this for dinner – i always loved when she did, and i always went back for seconds…and thirds. 4. there are no crazy ingredients – it’s all pretty straight forward. here they are: carrots, celery, potatoes, onion, garlic, kidney beans, canned whole tomatoes, bacon, basil, & oregano. you could also put some parmesan cheese on top when you serve it, like i do. and that’s it. pretty simple, right?! did you catch that i said “bacon”?! good heavens, this is gonna be good! oh, and i forgot to put in the picture: cabbage & chicken noodle soup (the chicken noodle soup gives the minestrone soup its noodles and the chicken flavor). and since i felt bad about leaving out the wonderful cabbage, here it is. 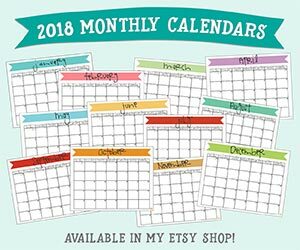 a word on cabbage: i absolutely love it! 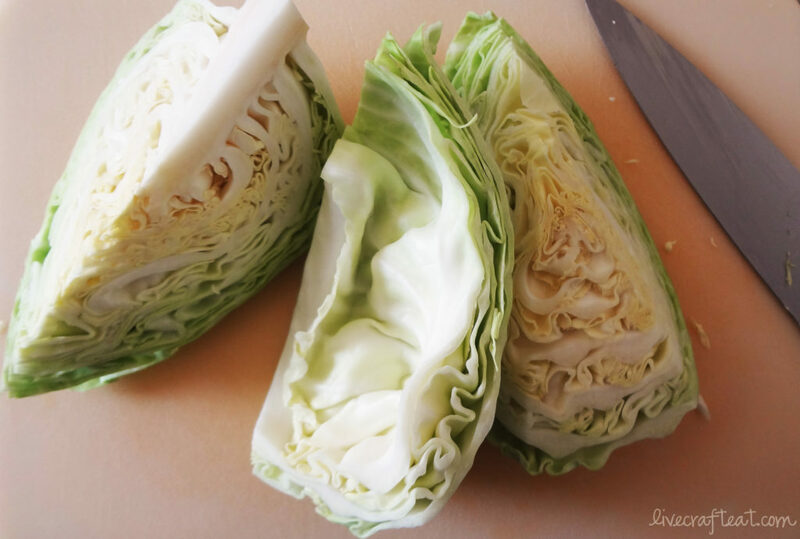 when i was younger and my mom would make this soup she’d save me a wedge of the cabbage and i would eat it layer by layer. i caught my kids doing the same thing today! you could also use your leftover cabbage to make homemade coleslaw for some bbq chicken sandwiches tomorrow night. yum! Saute bacon in a large pot; drain most of the fat, leaving approximately 1 tablespoon in pot. Sautee onions and garlic until onions are softened, about 3 minutes. Add 8 cups water and the remaining ingredients, except the chicken noodle soup mix. Simmer until vegetables are tender, about 15-20 minutes. Add dry chicken noodle soup and simmer 10 minutes more. Serve with parmesan cheese on top, optional. Enjoy! I LOVE this recipe. Always makes me think of home when I make it! i know, me too! 🙂 love it! When I was a child my favorite soup was Campbell’s minestrone soup. Sadly, that soup just tastes like salt to me now. 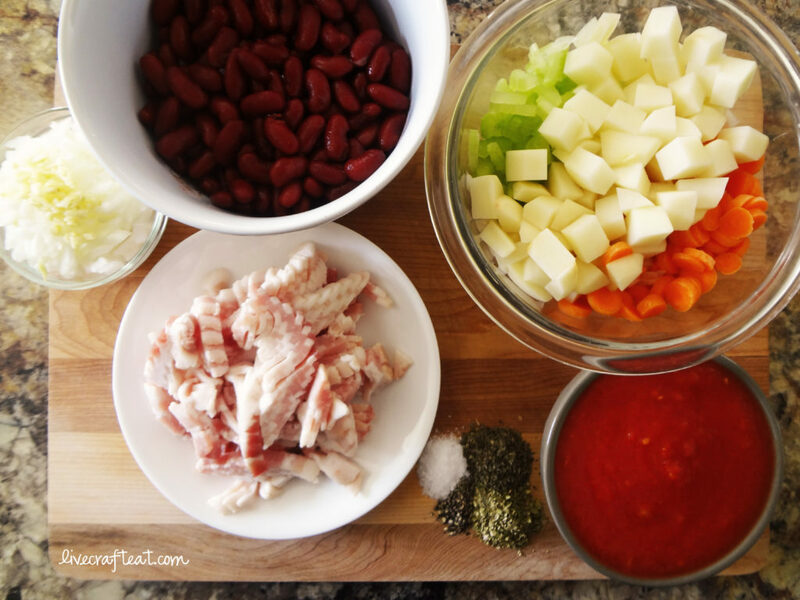 I am so glad to have a good, homemade minestrone soup to try. 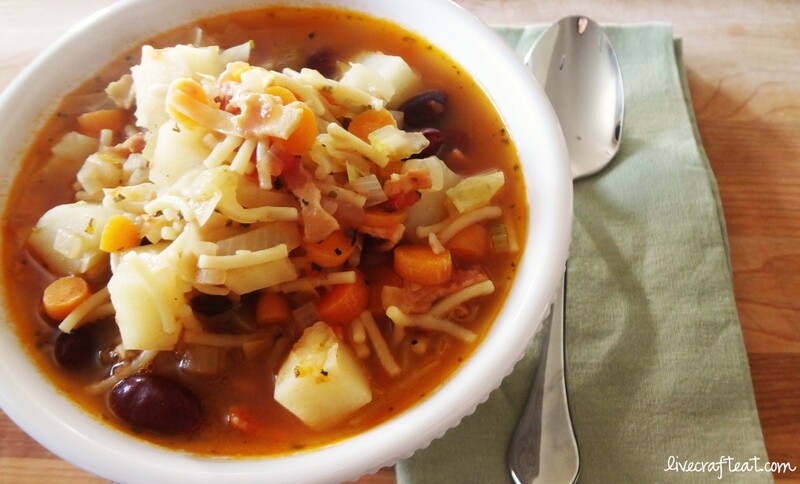 I have been missing minestrone soup. Thanks! 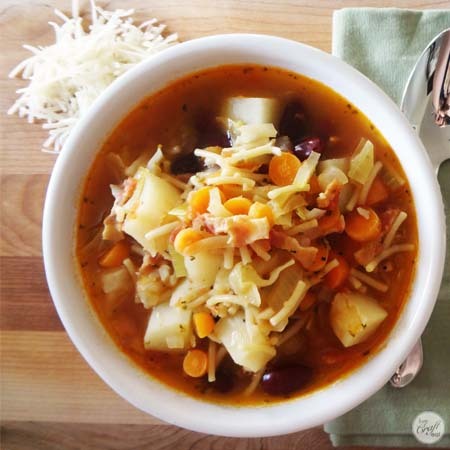 I know – I used to love their minestrone soup, too! They just don’t taste the same anymore, huh?